Australia’s cultural capital also just happens to be a foodie heaven, fashion destination, sporting mecca and major-event magnet. Where else can you experience it all in one place? With dozens of five-star, family-friendly or budget Melbourne hotels to choose from, the annual ACCOM: Melbourne Accommodation Guide 2017 makes an ideal first port of call when planning your Melbourne escape. Wake up in your hotel of choice and dive into Melbourne’s labyrinth of laneways and arcades. Find breakfast on Degraves Street or Hardware Lane while you plot your next steps, then visit the boutiques along Flinders Lane and the charming stores inside Royal Arcade before launching yourself into Emporium Melbourne and Melbourne Central shopping centres. For lunch, embrace the city’s bustling Chinatown district along Little Bourke Street. From no-frills dumplings to the finest of Cantonese dining, all budgets and tastes are catered for. Saturday afternoons in Melbourne are made for sport so, whether you’re in town for the footy or cricket season, the action will be happening at the Melbourne Cricket Ground and Etihad Stadium. Give your tastebuds a Saturday-night thrill and step inside one of Melbourne’s myriad restaurants. 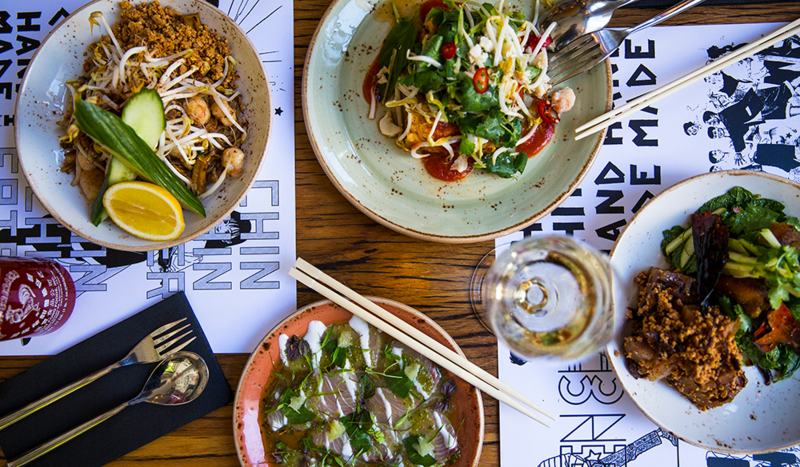 Again, some of the best can be found off the main streets, so try Little Collins Street or the east end of Flinders Lane – you can’t go past Chin Chin for authentic Asian flavours and a great buzz. Alternatively, catch a 10-minute tram ride to the inner northern suburbs of Collingwood or Fitzroy, where local chefs are producing mouth-watering meals at restaurants along Brunswick, Gertrude and Smith Streets. Fancy a drink after dinner? Pop past The Everleigh for a classic cocktail or craft beer in an intimate and sophisticated setting. If you’re up for it, start your day with a lap of the 3.8-kilometre Tan Track around the city’s gorgeous Royal Botanic Gardens. After a quick shower and breakfast, indulge your cultural curiosities at the National Gallery of Victoria (NGV) or the Australian Centre for the Moving Image (ACMI). Which side of the river will you choose for lunch? The Southbank precinct is home to some of the city’s finest restaurants as well as a few family-friendly options, while relatively recent additions on the north riverbank include Arbory, Pilgrim and Riverland (the nearby Birrarung Marr Playground is fantastic if the kids need to burn off some energy). Then settle in to enjoy a matinee performance of one of Melbourne’s endless parade of theatre shows. Catch a Broadway blockbuster in the East End or head to Arts Centre Melbourne for a local production by the Melbourne Theatre Company. However you want to spend a weekend in Melbourne, the city will have something waiting for you. For more information visit melbournenow.com.au/accommodation-guide.